From New York Times bestselling author James Rollins comes a novel of boundless imagination and meticulous research, a book that dares to answer a frightening question at the heart of America: Could the founding of the United States be based on a fundamental lie? The shocking truth lies hidden within the ruins of an impossibility, a lost colony of the Americas vanished in time and cursed into oblivion. A place known only as The Devil Colony. Deep in the Rocky Mountains, a gruesome discovery—hundreds of mummified bodies—stirs international attention and fervent controversy. Despite doubts about the bodies' origins, the local Native American Heritage Commission lays claim to the prehistoric remains, along with the strange artifacts found in the same cavern: gold plates inscribed with an unfathomable script. During a riot at the dig site, an anthropologist dies horribly, burned to ashes in a fiery explosion in plain view of television cameras. All evidence points to a radical group of Native Americans, including one agitator, a teenage firebrand who escapes with a vital clue to the murder and calls on the one person who might help—her uncle, Painter Crowe, Director of Sigma Force. To protect his niece and uncover the truth, Painter will ignite a war among the nation's most powerful intelligence agencies. Yet an even greater threat looms as events in the Rocky Mountains have set in motion a frightening chain reaction, a geological meltdown that threatens the entire western half of the U.S. From the volcanic peaks of Iceland to the blistering deserts of the American Southwest, from the gold vaults of Fort Knox to the bubbling geysers of Yellowstone, Painter Crowe joins forces with Commander Gray Pierce to penetrate the shadowy heart of a dark cabal, one that has been manipulating American history since the founding of the thirteen colonies. But can Painter discover the truth—one that could topple governments—before it destroys all he holds dear? 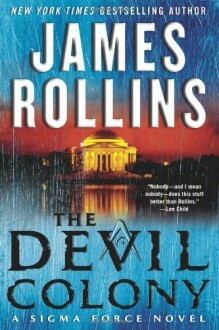 Typical wonderful James Rollins. A great read!